You’ve all been asking for it and now it’s finally here on the site. 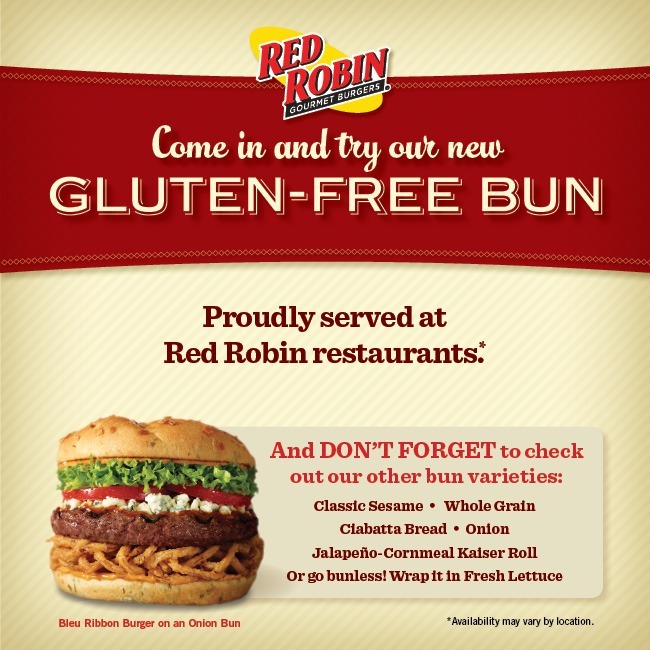 Introducing the Red Robin Gluten Free Menu featuring the all-new Red Robin gluten free bun. According to many of this sites readers and fellow foodies, Red Robin does a pretty good job when it comes to their gluten free menu. First of all they have separate, dedicated french fry fryers which virtually almost eliminates any risk of cross contamination. So that means yes, the bottomless (all you can eat) steak fries are gluten free! Second of all, you can order the famous fire-grilled hamburgers protein style (in a lettuce wrap) or with the Red Robin gluten free bun. The only thing that you need to watch out for is all the sandwich/burger dressings and toppings because a majority of them have gluten in them. So overall, the Red Robin gluten free menu is starting to become one of my favorites, especially since they have all you can eat steak fries, and a gluten free hamburger bun. This truly is something that I can hum “yummmmm” too. All burgers MUST be ordered protein style (wrapped in lettuces instead of the bun) or with the Red Robin gluten bun. Bruschetta Chicken Burger with no tomato-bruschetta salsa. Plus, you can also check out 4 other great places that offers a great gluten free burger. March 19th 2013. 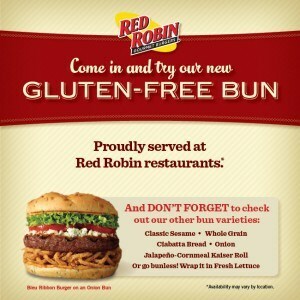 Tried the Red Robin Gluten free bun on their hamburger. They take extra care, telling me of modifications to the ingredients of the toppings to keep it gluten free. Also withheld seasonings that could contain gluten contamination. Excellent job RR! I will gladly drive the 4 extra miles. My new takeout standard. Also just discovered: Sweet Baby Ray barbecue sauce is gluten free! That’s awesome! I love it when restaurants go the extra mile to make our dining experience just a little better. Kudos to you RR! Sweet Baby Ray is my go to. Is the Gluten free bun also potato, corn, dairy, and soy free? I seriously doubt that it would be. Red Robin Rocks For Gluten Free! Total Concern Our Order Was Gluten Free. I really like RR’s gf bun. I feel like I’m eating a good burger on a good bun. The one thing I miss most is being able to “just” eat out and go WHERE ever I want to. RR made it possible for me to enjoy a burger and fries again. I just ate there a couple of days ago and enjoyed a cheeseburger & steak fries. The server and manager were great about discussing my options and assuring me of the safe food prep. I also had my two sons who have egg, peanut & tree nut allergies with me and enjoyed meals that were safe for them. It was a very positive experience and we will definitely be going back to Red Robin! We ate there recently, I wish I’d read about this bc my daughter is gluten free recently, and she had a chicken sandwich w the lettuce wedge which she was less than thrilled with. The server never mentioned any gluten free bun! We specifically said she has to be gluten free to her. So this is so good to read bc it’s one of my families favorite places to eat pre-dietary changes. I was told at the resturant that you have to order the steak fries without seasoning to be GF. Thanks for the extra tip Michelle. Super helpful! would also like to know, Is the Gluten free bun also potato, corn, dairy, and soy free? is it a brown rice base? so which condiments are gluten free if only the majority are not? Just found you site, i love all the great info. It really helps to have everyone’s comments also on their own personal experience. My family loves Red Robin I actually never been there prior to being GF they are so great in taking care that your food is gluten free all the servers are very knowledgeable about what’s GF and on top of that they have a rule that the manager has to bring out your food in a basket designated only for people with allergies. I also have never got sick there and I’m super sensitive to gluten and always no right away when I’ve been glutened. They also have dedicated fryers for their steak fries and they always tell you that their seasoning is gf but they don’t recommend people on a gf diet to use it because many people have reactions, the manager said that they think probably it gets cross contaminated at the factory where its made. I just had the bacon cheeseburger at Red Robin in Nampa, Idaho. It was delicious! The bun was good too, as were the fries. The personnel were very attentive and assured me that there would be no “cross contamination,” because they pride themselves on having separate baskets for “GF” fries. Needless to say, Red Robin is at the top of my list to go to. By the way, I highly encourage others to purchase Adam’s book on GF Fastfood as it is very informative. I’ve always loved Red Robin, but since being diagnosed with a wheat allergy, Red Robin is my go-to place for gluten-free take-out too. They are so accommodating. I’m thrilled! Red Robin rocks! 😀 I’m actually meeting friends there tonight. Heard from a hostess that the insane romaine salad is gluten free if you order it without the croutons. The Caesar dressing is GF. We love RR. Last year my daughter was diagnosed with a wheat and yeast allergy. It’s unbelievable the things yeast is in. She has had to change the way she eats completely and it’s not easy. The gluten free bun sounds wonderful but, it would be great if we knew if yeast was also in the GF bun and actually everything else. It’s really reall difficult for her eating out with these two allergies.